halloween - a scary eve for those with severe food allergies! 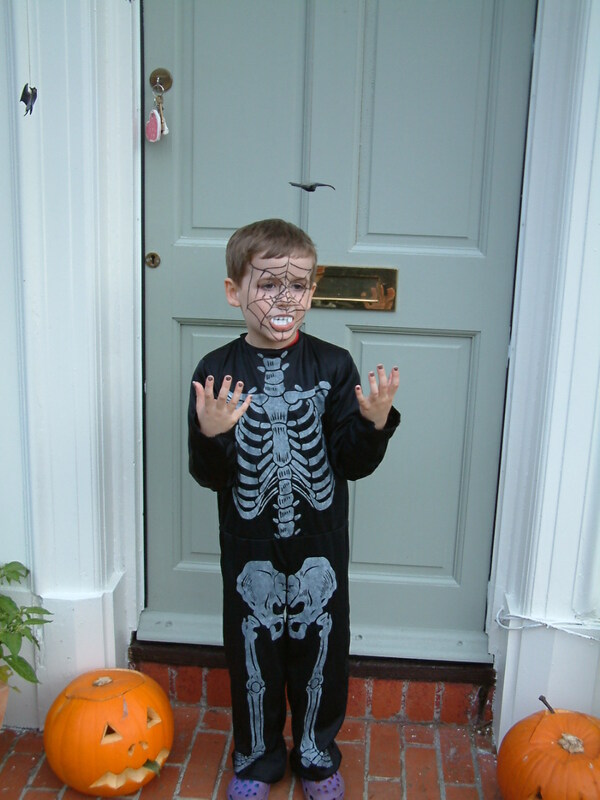 halloween – a scary eve for those with severe food allergies! All Hallows Evening a.k.a Halloween is this evening. It’s become synonymous with kids dressing up and venturing out to trick or treat in their neighbourhood. It’s a strange night especially when children knock on the doors of people they don’t know. We teach them not to accept treats or sweets from strangers – yet on this night, hidden in weird costumes it’s bizarrely encouraged! For parents of children with severe food allergies and contact allergies it can be especially stressful. In the last decade, the cases of food allergies have doubled and the number of hospitalisations caused by severe allergic reactions has increased 7-fold (EAACI, 2015). There has been a 615% increase in hospital admissions for anaphylaxis between1992-2012 (Turner et al, JACI, 2015). In 2011the National Institute for Health and Clinical Excellence stated that between 6-8% of children in the UK had proven food allergies. Then one year it all went horribly wrong. My son went into anaphylactic shock. I had done my little pre-halloween visits to the neighbours so knew the homes we’d be visiting for trick or treats were supplied with safe treats for Aaron – glow-sticks, plastic bats and spiders, party poppers and some safe haribo packets of sweets. After all the years we’d been doing it the neighbours had it sussed. it’s never too early to be dressed & ready for trick or treating! 2009 when we thought we had it sussed! We finally finished our wander round the houses and had returned home. Aaron and the neighbours children were all excitedly comparing their loot in their pumpkin buckets, playing in the dark and scoffing the sweeties they’d procured. Aaron was seven and knew he had to let me check over the ingredients of his sweets before he could eat anything. He came over with his pumpkin bucket to ask what he could have. I spotted a kinnerton free-from chocolate lolly in the bucket I’d ordered online from the supermarket as a safe sweet free-from treat for Aars. So I said he could eat that. He got stuck in, saying it was the best chocolate he’d ever tasted and I continued my conversation with my neighbour Luke. Aaron had run off to be with his friends, but in less than a minute he was back tugging on my sleeve, and trying to talk to me. I assumed he wanted more sweets and told him it was rude to interrupt adults when they were talking. He was going into anaphylactic shock. My neighbour carried him into the house, whilst I called 999 and got his meds out. Aaron couldn’t talk, there was no point trying to get him to swallow any antihistamine syrup. Because he was struggling to breath I sat him in the kitchen, rather than lie him down. I then “administered” EpiPen to him through his black halloween costume. It was awful – I had to stab my seven year old boy in the leg, after holding it in for a long ten seconds I removed it – back then there was no retraction of the needle – instead the huge needle lay beside us on the kitchen table as I massaged the area for a further 10 seconds. The joy of AAI’s is that they do work, and quickly soon he was breathing again and able to talk. All Aaron says he can recall was his devastation at not being able to eat the red shoe-strings I had bought for trick or treaters – I had told them were vampire veins. I was scared of cross contamination and all his trick or treat booty was given to the neighbours or chucked in the bin. It turned out the supermarket had sent the kinnerton nut-free chocolate lollies, not the dairy-free chocolate lollies. They look almost identical and as I had provided them I didn’t double check the ingredients in the dark that horrible halloween. The supermarket sent us a £50 voucher, by way of apology for our next online shop! Unsurprisingly it ruined halloween for us and so for many years we’ve enjoyed the run up to halloween. The pumpkin-tastic tasty parts – picking, carving and eating pumpkins with the neighbours. But on the night of halloween, when the witching hour is upon us and the neighbours are trick or treating we are somewhere free-from trick or treating! Somewhere special, somewhere fun, somewhere relatively safe! This year we will be at the cinema watching Inferno, last year Halloween was during half-term and we were at a theme park watching fireworks and riding the roller-coasters in the dark. If you are interested in how we survived Halloween for years with severe food allergies and no incidents I am giving away my Halloween Survival Guide ebook for free if you sign up for our weekly newsletter today. If you are interested in our alternative Halloween jolly’s over the last five years since that fateful night they’re also listed in our Halloween Survival Guide which you can receive for free if you sign up for our weekly newsletter today! In the meantime I thought you may enjoy some yummy scrummy pumpkin recipes free-from eggs, dairy, gluten, soy, nuts but packed full of flavour and YUM! Have a happy and safe All Hallows Eve! We love, love, love roasted pumpkin seeds! It is a slightly laborious task but the end result rocks! Our neighbours donate their pumpkin seeds to us around halloween so we have a steady flow of roasted seeds which are consumed at a rapid rate! Adapt the spicing to suit your families preferences. Preheat oven to 170ºC (fan) & boil a kettle of water. Scoop the seeds out of your pumpkin and into a bowl. Separate the seeds from the membrane, placing the seeds into a sieve or a colander & rinse them thoroughly under running water. Pop the boiling water into a pan and drop the seeds in too, simmer them for 10 mins and watch them dance (it's pretty awesome! see photo) or get on with making your spicy coating (stage 3!) After the seeds have simmered for ten minutes drain them and dry them lightly with a kitchen towel. In a bowl add the olive oil, muscovado sugar, ground cayenne pepper, cumin powder and a twist of salt*. Stir the seeds and ensure they are covered. Now spread them out on a baking tray. Roast them for 10 minutes, then take them out of the oven and mix them up a bit before popping back into the oven for another 7 minutes. Then get them out and let them cool before tucking in! The most amazing aspect of this pumpkin soup is that it has a lovely creamy texture even though there is no cream or cream alternatives in it. I like my cayenne pepper but if you're not into hot, hot, hot reduce the amount of chillies, especially if you are expecting children to eat it! IT goes really well with the basic free-from bread I make. When the spices start to change colour bung your chopped onion into the mix and stir, then place the lid on the pan and leave the onion to sauté and sweat. (I skin and chop up my pumpkin now - see photo for size) When the onion becomes translucent pop all your pumpkin chunks into the pan along with the vegan swiss bullion. Stir. When the spices and swiss bullion start to stick to the bottom of the pan add your hot water, stir it in to ensure nothing remains stuck to the bottom of the pan, bring to the boil, then cover with the lid, turn the heat down and leave to simmer for 15 minutes. After 15 minutes the pumpkin should be fully cooked and soft. Ladle the lot into your liquidiser and blitz. Then pour into your waiting bowls. Preheat your oven to 180°C (fan) and prep your muffin tins with cases. In a bowl combine the marmite & boiling water; stir until the marmite has completely dissolved. Then add the ingredients in the following order: oats, ground flaxseed, cayenne pepper, m!lk alternative, oil, grated pumpkin. Stir it all up and then add the flour and bicarbonate of soda. Stir these in too. As soon as it's all pretty much combined dollop out into the waiting cases and then pop into the oven for 30 mins. When they come out of the oven leave to stand in their tins for 5 minutes before placing them on the cooling rack. If you like pumpkin seeds add them in at the end. Aars doesn't like them in muffins so I do half of the muffins without them, then add ½ C seeds to the remaining half of the mix for my muffins, as I love them! These pumpkin muffins are really subtly flavoured with spice, making them very nice for little ones. You don't need to grate the pumpkin too finely for it to disappear into the muffin and become invisible when your children eat them. If you struggle to get your children to eat veg this is a great and yummy way to do it! Preheat the oven to 180°C (fan) and line your muffin tins with cases. these thick shreds of pumpkin disappear when baked! Make your flax egg by combining the ground flaxseed and water in a mug, stir occasionally so that it can congeal into an gloopy egg-like consistency. In a bowl combine the oats, maple and spices. Then grate your pumpkin and add it to the mix along with the oil & vinegar. Combine these together before adding the flour & bicarbonate of soda. Spoon into the waiting cases and pop into the oven for 17 minutes to bake. When they come out of the oven leave them in their tins for 5 minutes before placing on a cooling rack. These are really scrummy with our vegan orange icing - recipe is here!